Born December 7, 1907, at Wright, Kansas. Died July 26, 1987, at Longmont, Boulder County, Colorado. Ralph moved with his family from Wright to near Eads, Colorado, at the age of nine. He was just thirteen when his mother died. When Ralph was about thirteen, a teacher said to him "Ralph, you do well enough in school you should consider high school." His answer was, "What's high school?" After she explained it to him, he agreed, and he moved into town when he graduated from the eighth grade, working at various jobs in Eads to pay for his board and room while attending high school, and graduating in 1927. 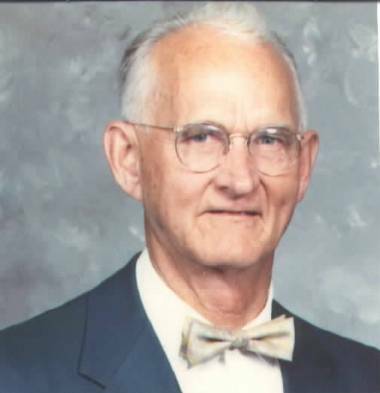 He then went to Greeley, Colorado, where he graduated from the Colorado State College of Education (later the University of Northern Colorado) in 1933. He worked while attending school, paying all of his expenses. Ralph met his future wife, Susie while they were both attending school in Greeley. Ralph worked at Hanson's Greenhouse in Greeley for several years, then was hired by the college as a gardener. They bought a home at 1909 6th Avenue, where Susie lived while Ralph was serving in the Army during World War II. Ralph was an officer and stationed in India part of the time. After the war, Ralph continued to serve in the Army Reserves and reached the rank of Lieutenant Colonel before retirement. Ralph bought the Hugo Cleaners in Hugo, Colorado, in 1947. At Hugo, he was an active civic leader, holding the position of mayor at one time. Susie was active in the Methodist Church there. In 1954, the family moved to Longmont, Colorado, where Ralph bought the Longmont Motor Company. He later sold that business and was employed by the State of Colorado Department of Veterans' Affairs. He commuted to work in Denver until retiring in 1973. Ralph married Alma Mae (Grover) Sanders, (b. September 1, 1922) October 1, 1971, at Lakewood, Jefferson County, Colorado. Alma was a widow of Daniel L. Sanders. Alma had four children, who were all adults in 1971. They both enjoyed Ralph's retirement, doing much traveling and living in their home at 337 Grant Street, Longmont, until his death in 1987. Ralph enjoyed working with wood, and spent many hours remodeling his home and building furniture. He also liked to garden, and every summer grew vegetables in a small plot.